At the invitation of Bruce Stewart we are parked up at the amazing urban Marae Tapu te Ranga, a creation of Bruce and friends who built it out of recycled materials in the 1970’s. 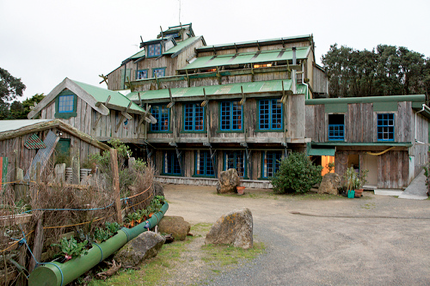 This “living marae”, which can accommodate 300 people, sits on 24 hectares of land given by the Sisters of Compassion next door that is being restored to its pre-human state. It’s an amazing place and Bruce is a living legend. He is still working tirelessly 16 hours a day not only on running the Marae and its humanitarian interests but also looking into new projects to bring housing and environmental restoration to the land he loves. Thank you so much for such missional and inspiring posts! I just found your blog and am truly inspired.